The Indian TV market has seen significant transitions in last one decade. The market which was once dominated by CRT TV, shifted towards plasma TV then LCD TVs and is now evolving towards LED TVs. Consumer's demand for multi-functional services, on-going TV network digitization and increasing internet penetration is helping smart TV market to grow in India. 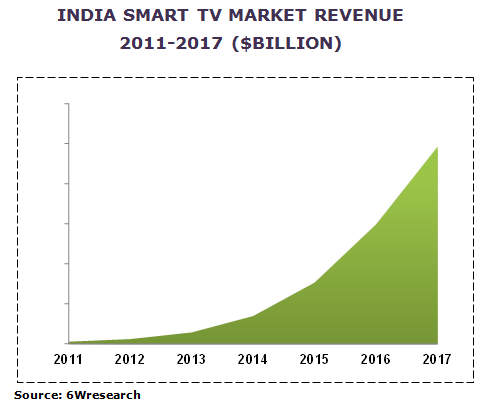 According to 6Wresearch, India smart TV market is expected to reach $10.41 billion by 2017, growing at a CAGR of 87.02% during the period 2012-2017. India smart TV market at present is in the nascent stage, but is displaying a healthy growth rate. The market growth is expected to stem mostly from the increasing demand for web-enabled TVs from individual customers, encouraged by the increasing number of functions and features offered by the smart TV vendors. Further, the growth of the India smart TV market is expected to be enhanced by the replacement of old TVs and the increasing number of internet users. According to 6Wresearch, India smart TV market is expected to reach $10.41 billion by 2017, growing at a CAGR of 87.02% from 2012-2017.